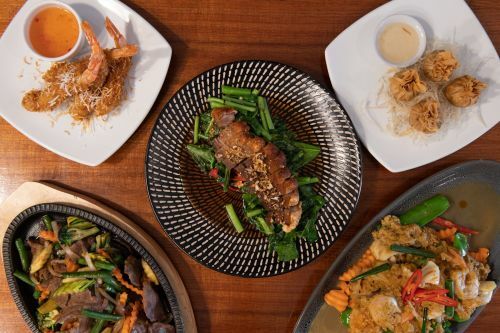 Titan Thai Restaurant and Cafe uses their own specialised couriers to deliver their food. Mixed soft shell crab and salt pepper squid. Deep fried battered soft shell crab and deep fried salt and pepper squid served with crispy fried red onion and sweet chilli sauce. Deep fried prawn battered with coconut served with sweet chilli sauce. Grandfather’s recipe, chicken and prawn mixed in wrapping. Golden pastry bags filled with minced chicken, mixed vegetables and coconut shredded served with sweet chilli sauce. Mixed salad, vermicelli rice noodle, carrot, bean sprouts, mints and hoisin sauce. Vermicelli tossed with very thinly slice of cabbage, carrot and fungus stuffed in rice pasty deep fried and served with sweet chilli sauce. Deep fried potato, onion wrapped in light pastry and served with sweet chilli plum sauce. Crispy but soft inside served with sweet chilli sauce or peanut sauce. Prawns chip deep fried served with peanut sauce. Prawn on cruncky toast, sprinkled with sesame seeds. Famous spicy Thai fish cake deep fried and served with sweet chilli sauce. Moderately spiced crab meat rolled into pastry deep fried and served with a tangy dipping sauce. Deep fried chicken wings marinated with Thai herbs. King of kings BBQ pork bun is filled with quality pork, roasted to perfection in a secret BBQ sauce and encased in a fluffy traditional bun. BBQ duck and vegetable wrapped in pancake with sweet honey sauce served on lettuce leaves. Steamed or deep fried. Steamed chicken mince and prawn stuffing wrapped in pastry served with soya sauce. A classic combination of prawn and ginger encased in a silky and light dumpling pastry. Grilled marinated chicken skewers served with a satay peanut sauce. Deep fried salt and pepper squid served with crispy fried red onion and sweet chilli sauce. One each of spring roll, curry puff, money bag and satay chicken. A famous Thai curry, flavoured with green chilli paste, kaffir lime leaves, sweet basil and vegetables. Traditional Thai red curry served with assorted vegetables, sweet basil and kaffir lime leaves. A mild creamy yellow curry perfectly blended with cumin, turmeric, coriander seed, garlic, lemongrass and traditional spices along with baby potato. Creamy red curry perfectly blended with peanut and paprika powder along with assorted vegetables and sweet basil leaves. Spicy curry, without coconut milk cooked with mixed Thai herbs and selected vegetable. Our classic mild creamy red curry along with baby bok choy and ripe mango slices on top. Boneless roasted duck cooked in red curry sauce companion with lychee, pineapple and cherry tomato along with assorted vegetables. Very mild curry of slow cooked tender beef cubes with potato and cashew nuts. BBQ lamb cutlets topped with full body of massaman curry with onion and baby potato. Steamed mixed seafood in red curry sauce with egg and basil. Stir fry Mongolian sauce with mixed vegetable. Sauteed shiitake mushroom, button mushroom, bok choy, tofu, snow pea, broccoli and red capsicum with cashew nut tossed in our special light soy sauce. Deep fried fish fillets topped with spicy three flavoured sauce. Soft shell crab stir fried with mixed vegetables, basil kaffir lime leaves and green peppercorns. Combination of chicken, beef, squid and prawns stir fried with chilli jam, onion and shallots mixed vegetable. Stir fried thin rice noodle with onion, bean sprouts, egg and garlic chives served with BBQ king prawns and crispy wonton. Very mild curry of slow cooked tender beef cubes with potato and cashew nut served with warm pita bread. Grilled salmon fillet served with spicy three flavoured sauce. Roasted duck fillets in traditional creamy coconut and red curry sauce with Thai basil served with steamed vegetables. Roasted duck tossed with in house plum sauce and spiced up with cinnamon and star anise served on a bed of bok choy and shiitake. King prawn in a traditional creamy coconut and spicy red curry sauce served with king. Deep fried whole barramundi served with a rich flavoured tamarind sauce. Chicken mince with roasted rice tossed in spicy Thai fresh herbs salad. Our forever favorites! Stir fried broccoli, snow pea, green bean, Chinese broccoli, onion, garlic with soy sauce. Marinated beef stir fried within house spicy sauce and assorted vegetable. Always delicious! A Roi means delicious. Crispy pork belly cracking on a bed of stir fried Chinese broccoli with oyster sauce. Stir fried king prawns with in house chilli paste, garlic, snow pea, red capsicum, basil leave and macadamia. Prawns and squid stir fried with egg, shallots, onions, capsicums, snow pea, mushrooms in curry sauce. Deep fried soft shell crabs and stir fried with egg, shallots, onions, capsicums, snow pea, mushrooms in curry sauce. Chicken thigh marinated with Thai herbs and served with steamed mixed vegetable and Thai dressing. The most popular street food in Thailand, grilled marinated pork served with "Nam Jim Jaew" and steamed mixed vegetable. Sliced rump steak marinated with Thai herbs and served with steamed mixed vegetable and Thai dressing. Lamb cutlets marinated with Thai herbs and served with steamed mixed vegetable and Thai dressing. Grilled king prawns served with steamed mixed vegetable, chilli and lime dressing. Thai style fried rice with egg only. Let’s try our Thai home style fried rice with snow pea and mixed vegetables. Our all time favourite Thai fried rice with fresh crushed chilli and garlic with snow pea and mixed vegetables. Stir fried rice with pineapple, onion, carrot, cashew nut, turmeric and curry powder. Classic Thai thin rice noodle dish, stir fried in three flavour sauce along with diced tofu, crushed peanut and bean sprout. Famous Thai stir fried rice sheet noodle flavoured with garlic, sweet soya sauce, egg, Chinese broccoli, mixed vegetables and a hint of ground white pepper. Stir fried hokkien noodle with egg, vegetable and oyster sauce. Stir fried rice sheet noodle with sweet soy sauce, egg, garlic, chilli and basil leaves. Stir fried rice sheet noodle with mild peanut sauce and traditional spices with assorted vegetable. Tasty in house chilli jam sauce stir fried with rice sheet noodle, assorted vegetables, roased cashew nut, water chestnut and dried chilli. Rice vermicelli noodle stir fry with eggs, onion, mixed vegetable, curry powder and oyster sauce. Vermicelli noodle in coconut curry soup with tofu and bean sprouts topped with fried onion and shallots. Full flavour of minced and fresh chilli with assorted vegetables, fragrant sweet basil leaves. Simple but healthy always works well with stir fry dishes and goes well with fresh ginger and shallot. Classic stir fry sauce in Thai kitchen goes well with mixed vegetables and sprinkled with dried onion. Tasty chilli jam sauce with assorted vegetables, roasted cashew nut and dried chilli. Flavoured by tomato sauce, pineapple, fresh tomatoes then stirred well with vegetables. In house sauce with the fragrance of garlic and ground while pepper with seasonal vegetables. Creamy peanut sauce mingled with traditional spices on top of stir fried vegetables and your selection of meat. Grilled chicken salad served with chilli jam dressing and cucumber, tomato, mint, onion and coriander. Roasted duck salad served with chilli jam, coconut milk, cucumber, tomato, onion and shallots dressed with lime juice. Grilled mixed seafood served with fresh chilli, onion and mint dressed with lime juice on top with cashew nut. Famous Thai spicy and sour soup with lemongrass, kaffir lime leaves, herbs and mushroom. Mild coconut broth flavoured with galangal, lemongrass, kaffir lime leaves, herbs and chilli jam lime dressing. Clear soup with Thai herbs, mushrooms, sliced chilli and basil. With ice cream and coconut milk. Topping: salted caramel, chocolate or mixed berries sauce. Topping: salted caramel, chocolate or mixed berries. Vanilla ice cream wrapped in filo pastry topped with roasted coconut flakes and sultanas. Espresso, piccolo, macchiato, flat white, cappuccino, latte, long black, hot chocolate, chai latte, matcha latte or sticky chai latte. Milkshake, smoothie, fresh juice, iced coffee, iced latte, iced mocha or frappe. Coke, diet coke, coke zero, lemonade, fanta or solo. English breakfast, sencha green, Jasmine green, peppermint, Earl grey, lemongrass, chai,chamomile or lychee Jasmine (special tea). Pineapple, fresh coconut or orange.